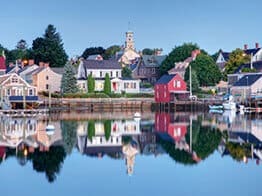 New Hampshire got its name in 1630 from the English county that Captain John Mason hailed, Hampshire, which is near Southampton, England. The Algonquian Indians, who inhabited the state for hundreds of years prior, undoubtedly had another and probably cooler name for New Hampshire, but we will never know. The Indians likely traversed northern New Hampshire quicker and easier than most auto transport carriers, because it can be tough in certain regions. Now New Hampshire car transport drivers get around seamlessly. A customer using our innovative New Hampshire car transport calculator will discover very competitive pricing emanating from the southeastern corner of the state, which is almost an extension of greater Boston. Folks in New Hampshire from Concord and Dover south will tell you that they have their own identity, thank you very much, but others notice lots of Red Sox hats here and there. It’s all good because auto shippers have an easy time of it shipping cars in and out of places such as Manchester and Portsmouth, and that is largely due to the proximity to Beantown. Interstate I-95 slices through the very southeastern tip of New Hampshire on its way north to Maine. Also coming out of Boston and heading due north is I-93 which cuts through Derry, Manchester and Concord. Both those interstates make it easy to fetch cars and deliver them. The northern half of New Hampshire reaching up from Lebanon to the Canadian border is extremely difficult to ship cars in a timely fashion. Interstates I-89 and I-93 fork at Concord and soon thereafter in both directions, north and northwest, things get a little dicey in the auto transport world. The farther north you go the harder it gets to ship quick. Throw in some winter bad weather and the customer is really out of luck. It is only moderately better southwest of I-89 to the Vermont and Massachusetts borders. We like to be upfront about that logistical problems so that customers may plan accordingly. Our vehicle shipping quotes calculator attempts to add a little extra to lure a driver off the major interstates to either fetch a car or deliver one. The rates are higher and that is why. Not trying to be mean, just trying to get it done is all. Please visit Direct Express Auto Transport to fill out a simple form and get a free car shipping quote. We make it easy to book your vehicle shipment online.